By creating your own Cabo San Lucas fishing package you're going to save money so you have more to spend on your fishing. Most fishing companies will recommend hotels or condos that are more expensive than the budget hotels you can stay in. If you're only In Cabo San Lucas for the marlin fishing all you need is somewhere to sleep, and your Cabo fishing charter. If you want to go with the company that holds the record for the biggest Marlin caught in Cabo San Lucas then Juanitas Sport fishing offer you a good choice of Cabo fishing charters. Another popular Cabo San Lucas fishing charter service is Pisces Sport Fishing. It is a fishing company that has been established in Cabo San Lucas for over 25 years so they know the Cabo waters very well. Pisces Sport Fishing boats range from 28 feet to 111 feet so they will easily be able to accommodate you and the rest of your fisherman friends. Pisces do a great Cabo San Lucas fishing package saving you bringing any of your own food and drinks. This also includes your fishing licenses, your bait and the freezing of your catch if you decide to keep it. 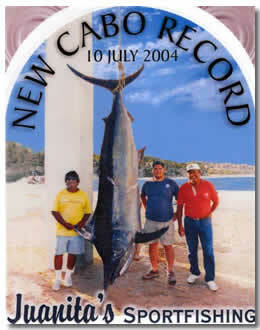 This is a good start to your Cabo San Lucas fishing package. All you need after booking your Cabo fishing charter is your hotel. You can save so much money going for the budget hotels in Cabo San Lucas. They're situated right next door to the nightlife so you don't need cabs to get around in the evening. And these Cabo hotels are some of the highest rated at Trip Advisor. Your rooms will start at $75 a night which gives you a week for less than a night at some of the Cabo San Lucas hotels and resorts. If you like to go out for a good time in the evenings these hotels are just right. Once you've finished drinking you're only a few minutes away from your bed. Clubs like Cabo Wabo and the Giggling Marlin are within a few blocks of your hotel. There's more information on Cabo budget hotels here. © 2005 - 2011 vacations-to-cabo-san-lucas.com - All Rights Reserved - Trademarks are the property of their respective owners.